Already have the uDirect 2 for your hearing aids? Purchase the Untron TV Link S separately. system to enjoy the convenience of wireless Bluetooth technology with your TV. This package combines the TV Link basestation with the streaming capability of the uDirect 2 and the convenience of a hand held remote. For hearing impaired people that have trouble understanding TV even with hearing aids the Unitron TV Link S will be a big help. 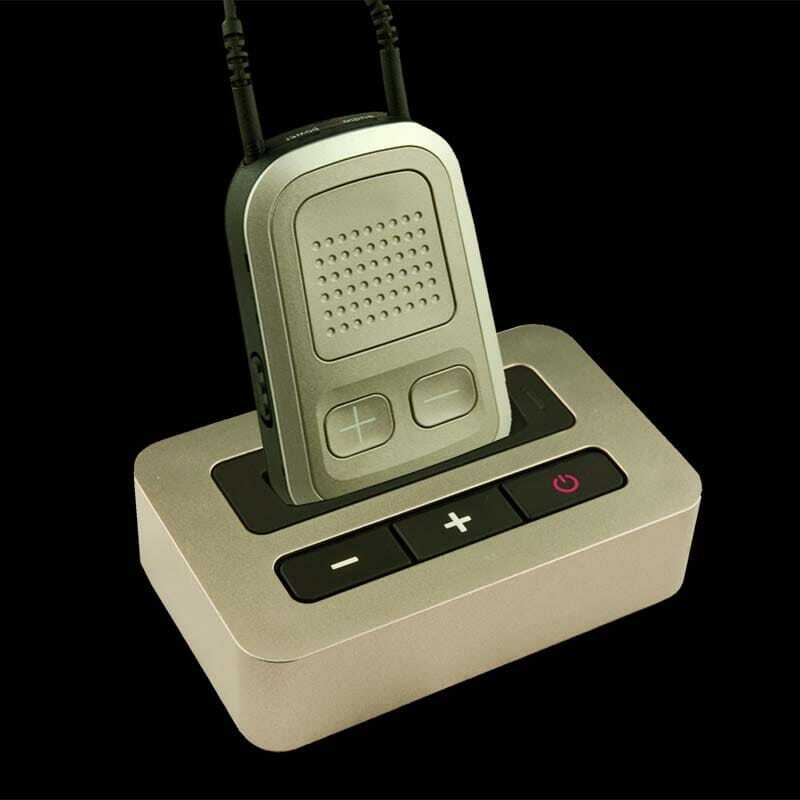 The Unitron TV Link S connects to the audio output or headphone jack of almost any audio source such as TVs, stereos, Mp3 players, radios, computers, etc. and then transmits that audio signal by BlueTooth to a wireless BlueTooth receiver you wear. The Unitron uDirect 2 is a good example of a BlueTooth receiver. They send the audio signal into your Unitron hearing aids so you get the audio signal in your hearing aids corrected for your hearing loss. When worn around the neck, the uDirect 2 enables you to receive transmissions from the TVLink S for up to 90 feet while being able to adjust the volume. The TVLink S also doubles as a charging dock for your remote streamer. With the Unitron TV Link S the audio signal arrives at the BlueTooth receiver you are wearing intact with no dissipation. The Unitron TV Link S is compatible with BlueTooth headsets and Unitron uDirect.